Guys, we all know that TRAI my speed App results are accurate and they showed that Airtel is slowest network. After this, Airtel has got certificate of being fastest network in India by a foreign company Ookla. After this Ad campaign, many true Indians were not happy so they tried to boycott Airtel as they tried to prove our TRAI speed test results wrong. This is truly shame for everybody as TRAI is government body and they are proving TRAI Speed Test wrong by continuous misleading advertisement on various platform. So, on March 20 Jio had filed a complaint with ASCI, urging to take appropriate action against this misleading advertisement. Finally, on 29 March, Fast Track Complaints Committee (FTCC) found that Airtel Ad is misleading and they informed Airtel to remove or modify Ad by 11 April 2017. After this, Airtel Said that we are not agree with ASCI decision and will file an appeal as per guidelines. 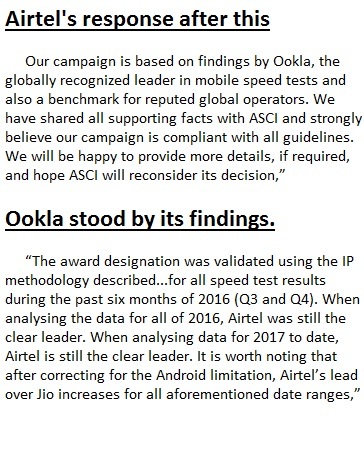 ASCI points out some reasons to support their decision of declaring Airtel's Ad as misleading. It is also noted that Airtel’s TVC does not state that the speed results pertain to a specific period. TVC has visuals with reference to 4G, whereas Ad was not specific to 4G technology as per Advertiser's claim. In Advertisement, they shows poor signal strength for the other service provider. FTCC considered this representation to be misleading by ambiguity and implication. Airtel used term "OFFICIALLY" while their test was not based on any government organization or authority like TRAI, hence it is misleading. So, once again Airtel is on backfoot and still struggling to find a way to get some relief from this incident but the sad thing is they are not finding ways of improving their network. They are spending huge sum of money on advertisement which are misleading and already paid fine in some cases since last year. Airtel is trying to show other operators poor so, to show them better and strong, while in actual they are not doing anything. On the other hand Jio is spending money on improving their signal strength, coverage and quality. Recently Jio announced to add 100k towers to extend their network in every part of India. Now, it is clear that Airtel's claim of being fastest network is false. So, here I want to show you some speed test results from TRAI myspeed website. 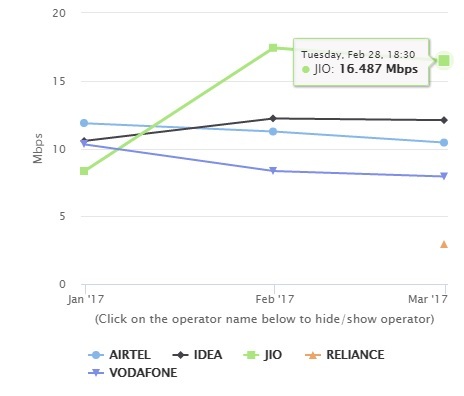 Here is monthly trend of all operators, Jio is still providing top speed for whole month, while all other operators are providing below 8Mbps. Here is monthly 4G speed comparison and here jio is still providing top speed while other are far behind in comparison of 4G data speed. This is speed test of India and it is clearly visible that Jio 4G speed is still better than Airtel and Idea. 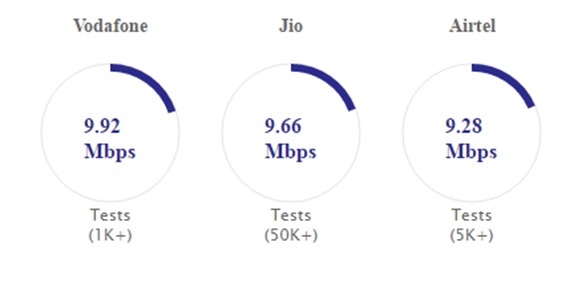 In all my past comparisons of Jio speeds, Mumbai is the only state where speed is very high. And also in every test Jio is able to give above 23 Mbps in Mumbai. Delhi is small but density is very high as people from other states usually came here everyday for various purposes, which give too much load on network operators. Here Jio speed was below 10 Mbps throughout past months but now it is 13.19 Mbps which shows Jio is improving day by day. Again, in Kolkata, Jio is leading in speed test results. While Idea overtook Airtel and got 2nd position. 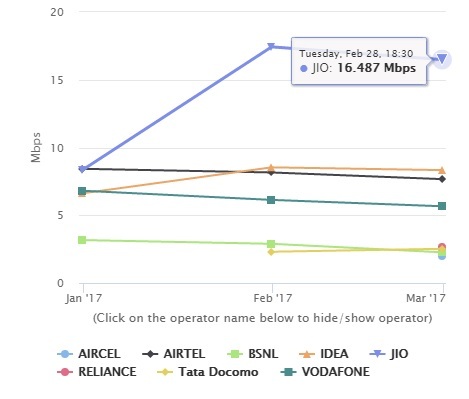 In Chennai, Vodafone is winning by marginal difference and we know within a month Jio will become topper in speed test results of Chennai. 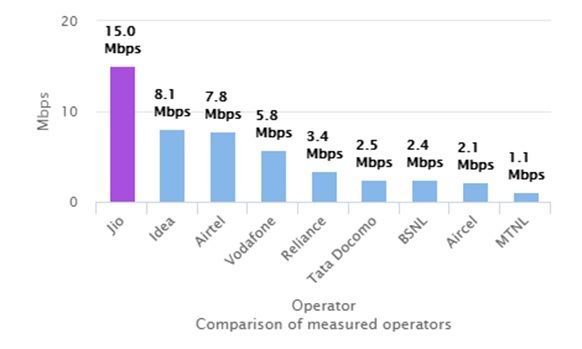 Here is a small comparison of speed test results of various operators. Here Jio is providing almost double speed than Idea and thrice than Vodafone. You can check more data on TRAI my speed website. The only thing I want to say is, Jio is our savior, Jio is best.